This entry was posted on Saturday, March 23rd, 2019 at 9:01 am and is filed under Uncategorized. You can follow any responses to this entry through the RSS 2.0 feed. You can leave a response, or trackback from your own site. Sounds like those who don’t know the etiquette of the trail had not been in scouting, as that is one of the first rules of hiking you learn. 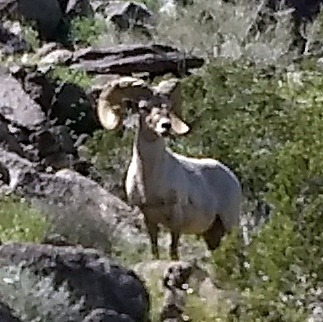 There must be plenty of food up in those hills, from the size and horns of that ram.